Although today the concept of writing on flags goes against our principles of flag etiquette, the practice of writing on flags for various reasons is an important aspect of flag history. Typically, writing can be categorized into a few general categories: political writing, commemorative writing, and advertising. In all cases, the practice uses the image of the flag to connect patriotic sentiment with a cause or event. The examples shown here demonstrate that whether used for commercial purposes or military, political or historical purposes, the presence of writing adds a fascinating dynamic to flags and allows collectors to attribute particular flags to times and events with greater accuracy. In this way, a great deal of the provenance of the flag is a part of the flag itself. President Lincoln Mourning Flag, 1865. 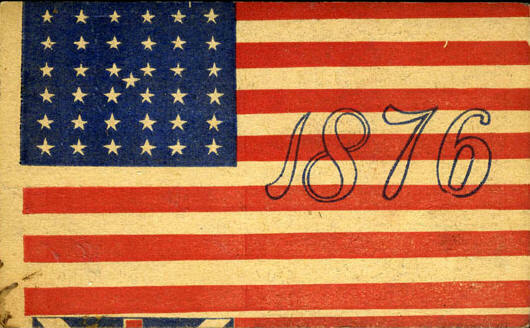 This is one of a series of five or six styles of paper-printed flags produced immediately following Abraham Lincoln's assassination on April 15, 1865. The black canton represents a nation in mourning. The words are concise, yet poignant, calling the beloved president "father". The flags were affixed to sticks and waved along the president's funeral route. The glue on the hoist of the flag where it was affixed to its stick is still visible. Andersonville Prison Memorial of W. H. Courtney, A Co., 12th New York Volunteers, 1864. 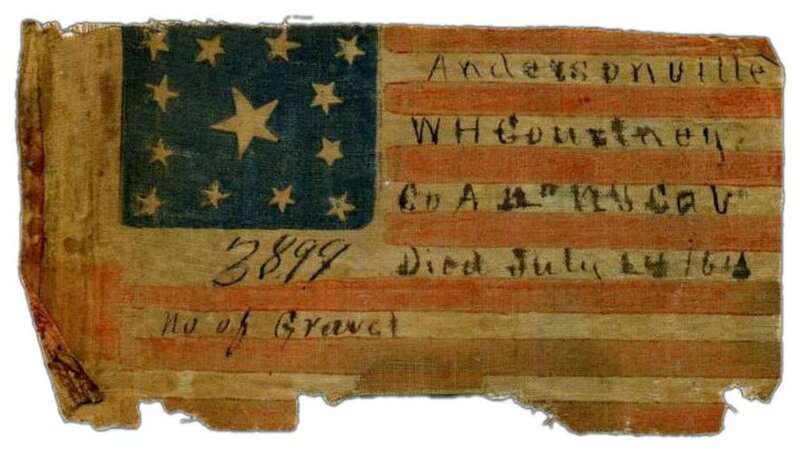 One of the most personal and poignant relics to have survived the American Civil War, this flag was present in Andersonville Prison and commemorates the death of Private William Courtney on July 14, 1864. A more detailed description of the flag can be found here. Dr. Martin Luther King, "I Have A Dream", August 28, 1963. Without a doubt among the rarest, if not the rarest, of all flags in the collection, this printed parade flag in pennant form was carried during the March On Washington on August 28, 1963 and present in the audience when Dr. Martin Luther King delivered his eternally famous "I Have A Dream" speech. "We Shall Overcome", the rallying cry of the early Civil Rights Movement, is printed in the canton. 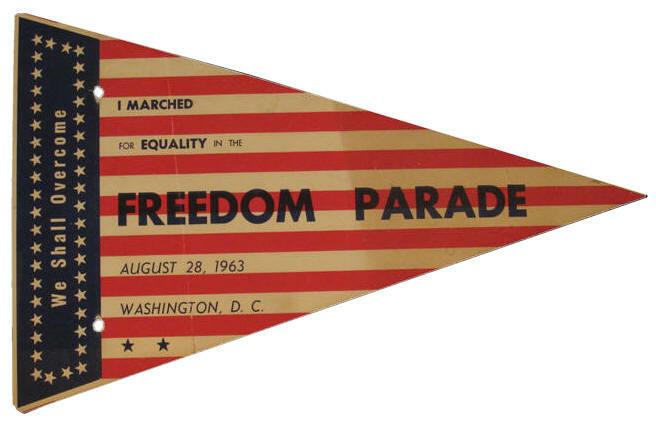 The presence of the date and location of the event, and the plain spoken words "I MARCHED FOR EQUALITY" make it perhaps the most extraordinary American flag-related artifact extant from the Civil Rights Movement. Centennial Advertising Card, 1876. 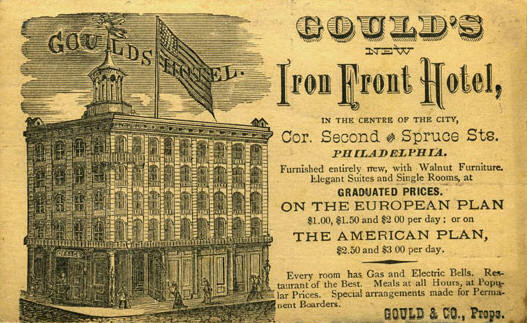 This Centennial advertising card from 1867 was printed as an advertisement for Gould's Hotel in Philadelphia. The bold, stylistic 1876 overprint and unusual 37 star configuration with a single central star on an otherwise standard 36 star field is a beautiful presentation. The uneven cut of the card shows the top of what appears to be the Canadian Red Ensign, a reminder of the international scope of the event. Hop Bitters Advertising Card, c1870. 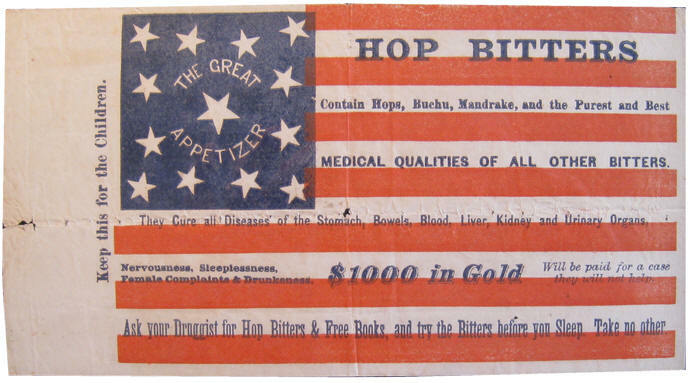 This fragile paper flag was packed and distributed along with Hop Bitters, a purportedly medicinal concoction of the 1870s. The flag is a great folk presentation, with fascinating writing including a $1000 in Gold promise to those who aren't cured, and an even bolder claim that the bitters can even treat "Nervousness, Sleeplessness, Female Complaints & Drunkenness", right next to the instructions to "Keep this [flag] for the Children." The presence of writing in the canton is especially rare. Lowe's Aeronauts Reunion, 1913. 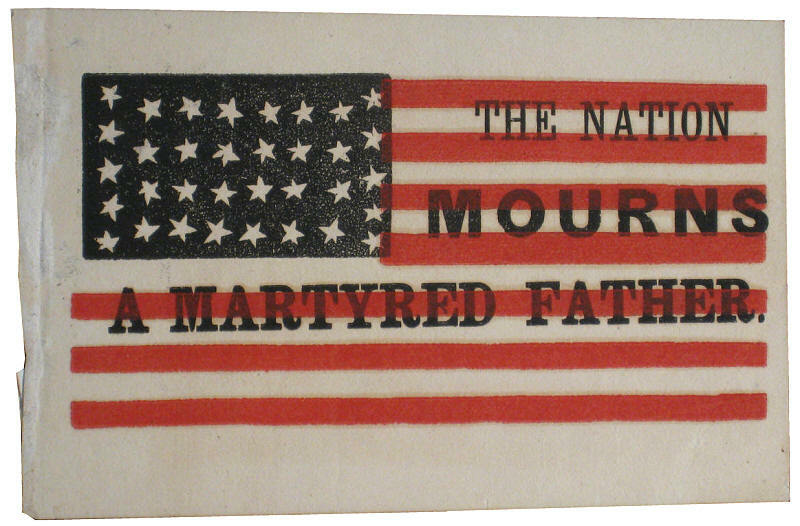 This fantastic overprint flag descended in the family of James Allen, a renowned early American aeronaut and assistant to Union Balloon Corps founder Thaddeus S. C. Lowe. Although the unit was technically a civilian unit, it is regarded as the earliest American military aeronautical unit and the earliest American employment of overhead surveillance for the purpose of gathering intelligence on enemy troop movements. The 48 stars of the flag became official just one year earlier in 1912. 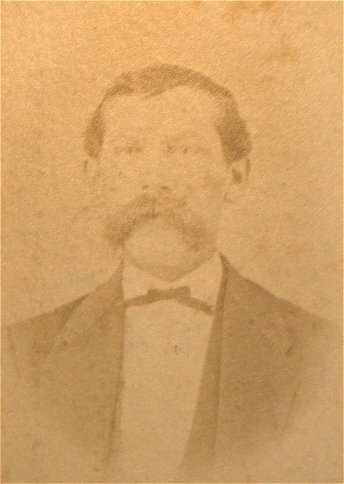 Left: James Allen, 1863. Right: Thaddeus Lowe ascending during the Battle of Seven Pines in the balloon The Intrepid, May 31 - June 1, 1862. Note the "Stars and Stripes" painted balloon basket. Roosevelt's Rough Riders Reunion, Circa 1900. 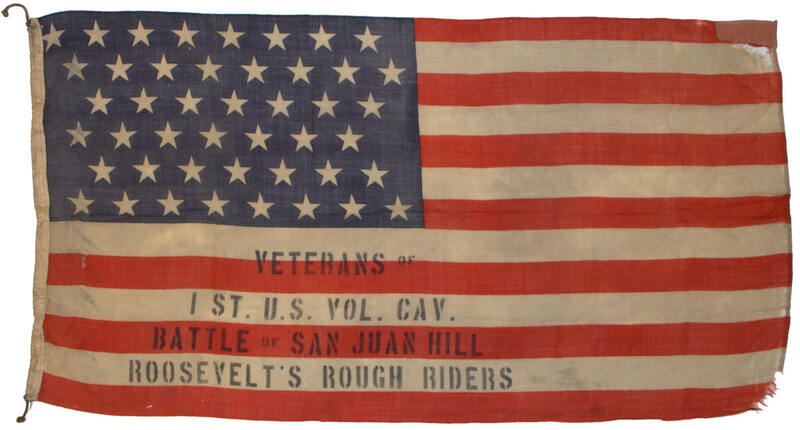 This very rare flag of 45 stars was made for one of the reunions of Theodore Roosevelt's famed Rough Riders, officially designed as the 1st U.S. Volunteer Cavalry. Aside from being associated with one of the most famed units in American military history, the flag's writing mentions the unit's most famous battles, the Battle of San Juan Hill, fought in Cuba on July 1, 1898. The flag is made of wool bunting with clamp dyed stars. The overprint is stenciled in large stencil letters. 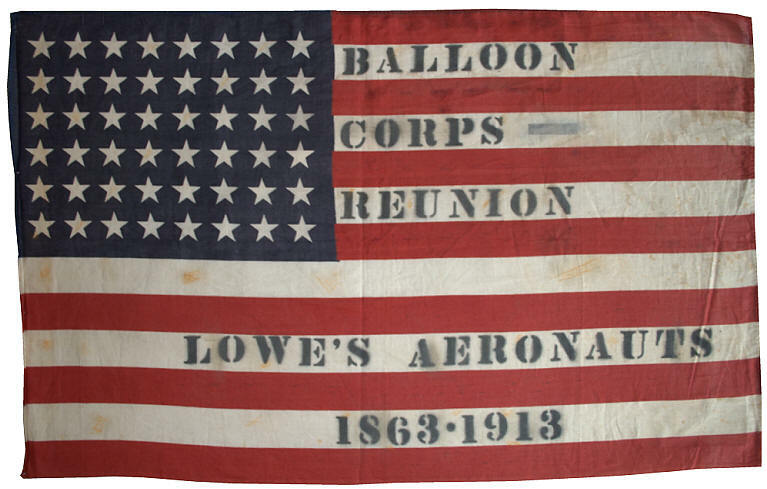 Like the Lowe's Aeronauts flag pictured above, stenciling was used to overprint commercial flags for military reunions in the early part of the 20th century. Buffalo Soldiers Reunion Flag. National Indian Wars Veteran's Camp No. 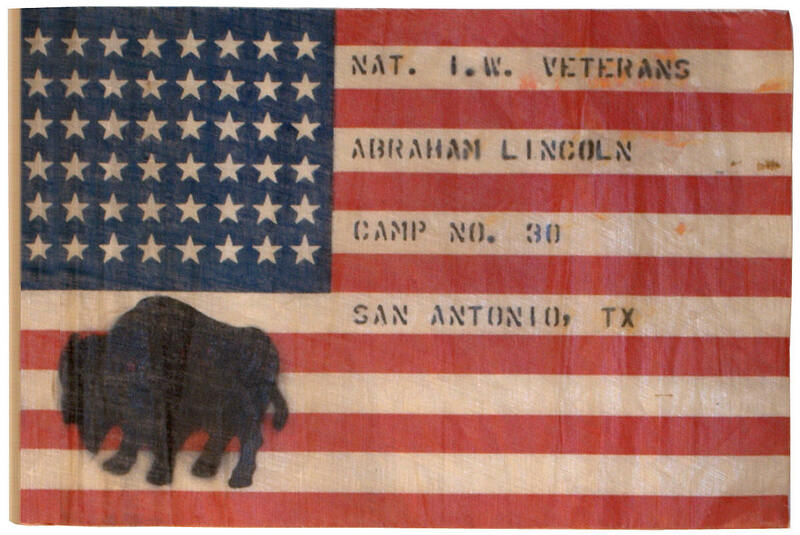 30, known as the Abraham Lincoln camp, was organized in San Antonio, Texas, on October 14, 1929 by Thomas J. Dilwood of B Company,10th US Cavalry. The 10th US Cavalry was one of the original Buffalo Soldiers regiments, and Camp No. 30 was the only all-black veteran's camp for the Indian Wars veterans. This flag, made for the veteran's camp, was found with the note: "This flag was purchased from the Kelly family. Their Great Grandfather Wm. H. Kelly was a member of Camp 30." 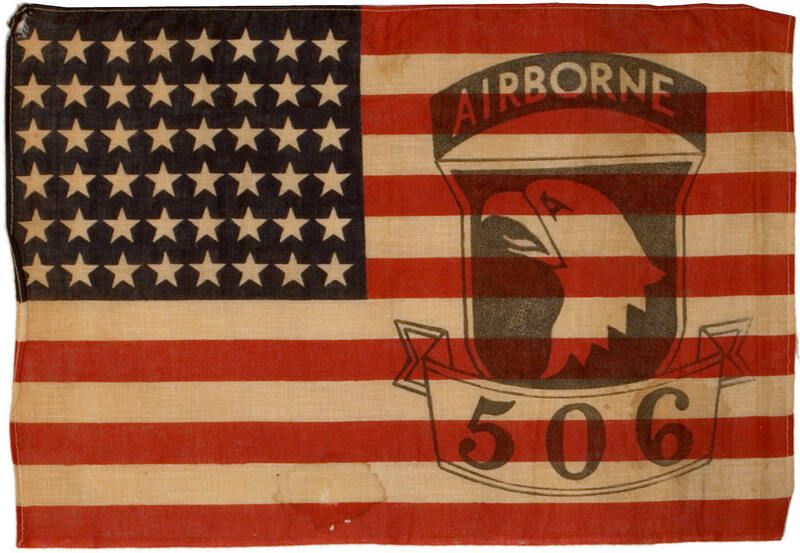 506th Parachute Infantry Regiment, 101st Airborne Division, "Band of Brothers" Reunion Flag. This rare reunion flag was found in an estate in Bergen County, New Jersey, along with a full dress uniform coat of a lieutenant of the 506th Regiment. A famous subordinate command of this unit, E Company ("Easy Company"), 2nd Battalion, 506th Parachute Infantry Regiment, 101st Airborne Division is the unit featured in the famed book "Band of Brothers" by author Stephen Ambrose, which was later made into an award winning classic television series by Tom Hanks and Stephen Spielberg. September 11, 2011, with a Graphic Representation of the World Trade Center and Lower Manhattan. 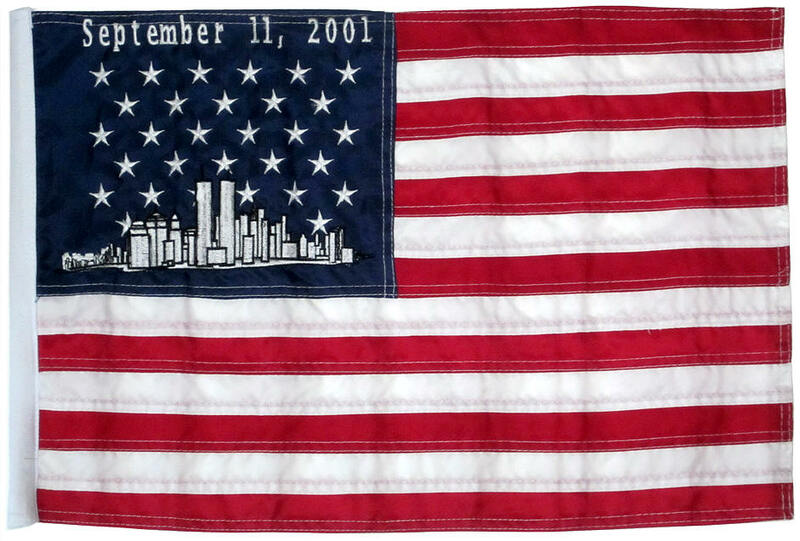 This flag is still manufactured and sold today, in various sizes including 3 feet x 5 feet, and in various construction techniques including sewn and embroidered polyester, or printed. This particular flag is a small variant, but is embroidered with sewn stripes. The design is covered by US Patent No. 464590.